Meriaura has signed five new time charter agreements. A deck cargo carrier, two multipurpose-heavy lift dry cargo vessels and two traditional dry bulk carriers are joining Meriaura fleet, the company said in its release. M/S Enough Talk is a deck cargo carrier of the same type and size as Meriaura’s deck cargo carriers Aura and Meri. Time chartering of M/S Enough Talk significantly increases Meriaura’s cargo capacity and position in the field of demanding project cargo shipments in Northern Europe. Increase in capacity brings more flexibility to the service and allows some of the equipment to be designated to longer-term projects. Multi-purpose-heavy lift vessels M/S Antonia (ex. Pietro Benedotti) and M/S Antje, that are both equipped with two heavy lift cranes are also suitable for project cargo transportations. The ships’ cranes can lift pieces up to 160 tons, and the vessels are equipped with tweendecks. The length of the ships enables the transport of for example wind turbine parts and blades, that have grown in size considerably in recent years. The vessels’ cargo capacities are approx. 8.500 and 7.900 tonnes and 12.000 cubic meters, and they are also well suitable for carrying bulk cargoes. Meriaura already started in the 8.000-tonner segment with M/S Airisto last autumn, and with the new contracts the company remarkably increases its tonnage in the new, larger segment. 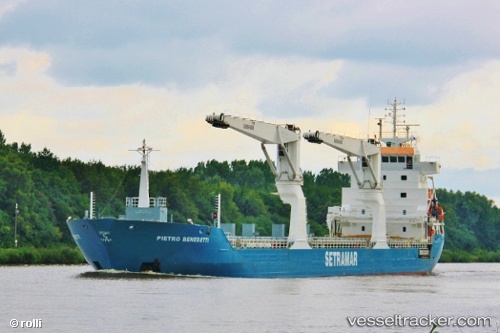 After the "Pietro Benedetti", being loaded with a cargo of petcoke, had suffered engine failure near the Azores and was towed to Praia do Vitoria, it was pulled to La Coruna after one week of investigations at Praia do Vitoria. After the cargo was transshipped with other ships, the vessel was docked in Vigo for repairs on Oct 10.